This one tried to bite many times and calmed after 10 minutes. 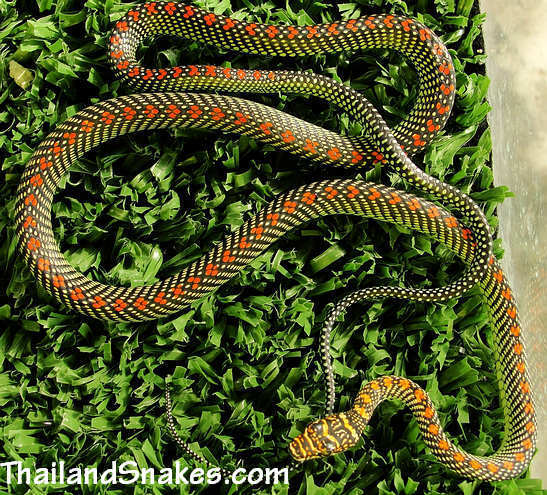 These are great snakes for a couple of reasons. Number 1 – their colors. 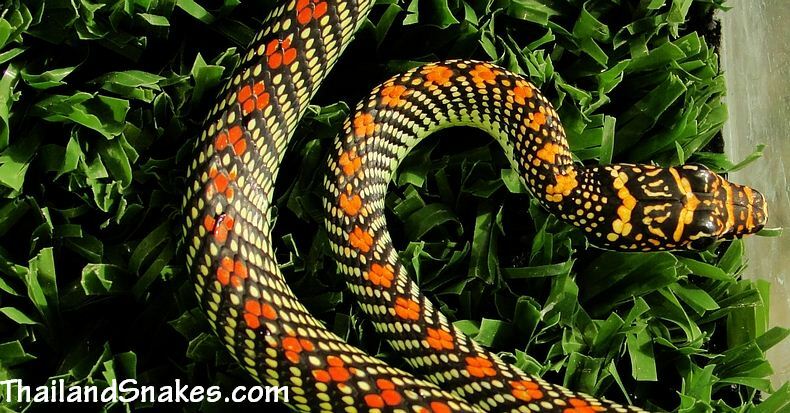 This snake looks like Christmas – right? Amazing oranges, greens, and blacks make it very unique. Number 2? They fly. Well, they glide very far when they jump from a high vantage point. They can glide dozens of meters – and probably more. 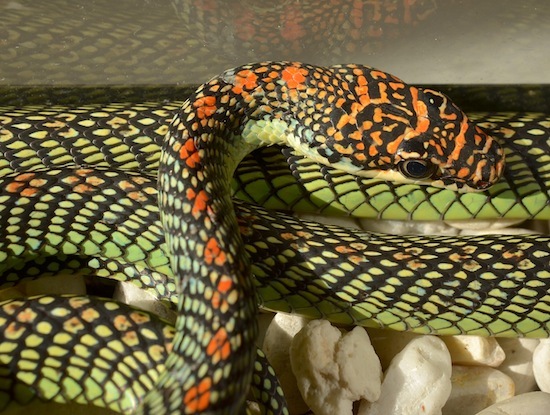 These snakes are limited only by how high they are when they jump. Typically they use their gliding ability to travel from tree to tree in search of prey, or to elude capture by a predator. Appearance: Very similar in all aspects to C. ornata with the exception of scale coloration. C. paradisi has black scales on the neck and body which have a green or yellow dot in the center of each scale. 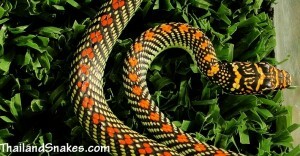 Scales on the dorsal near the vertebral column may have an orange or reddish coloration. Some call this the flower pattern. Great variation occurs as to how much orange is evident on the dorsal area – some have on the head, and completely down the body to the tail. Others have some orange on the head and a little bit on the neck, and none of the rest of the body. Range: Thailand-wide. This one was found in Krabi province at sea-level in a handbag shop at the beach. We’ve found them in rainforest near a Thailand resort as well. Habitat: Bushes, ground, trees, roofs. They are often found in palm tree fronds. I have found them there as well as small trees with big leaves and a lot of open area so they can see – presumably. I have found them as high as 500 meters vertically up a mountain in Thailand, and at sea level. Recently we found one 7 meters up a large tree on a hot sunny day. Active Time? Diurnal – active during the day in trees and bushes, and occasionally on the ground. Food: House geckos, Tokay geckos, lizards, bats, and frogs. Defensive Behavior: They bite very quickly, but have small mouths and teeth. There has been no medically significant case of envenomation mentioned in the literature. They are considered harmless for humans and probably pets over the size of a cat. Venom Toxicity: Weak for humans. Effective for geckos, frogs and bats. These are rear-fanged colubrids and a prolonged bite could cause swelling and pain at the bite site. Offspring: They produce eggs which hatch during May/June in Thailand. Notes: C. Paradisi is distinguished from C. ornata by the orange/red coloration at the top of the body, sometimes at the head, sometimes more of the body is colored, and sometimes the entire head and body are covered in the red flower like scale patterns. 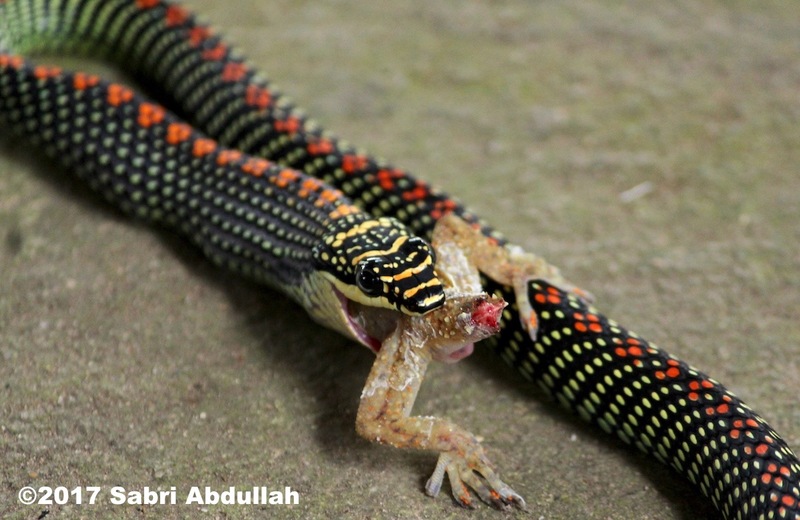 This paradise tree snake was caught grabbing gecko lunch in Singapore by David Joseph. Copyright 2011 – David Joseph. Used with permission. 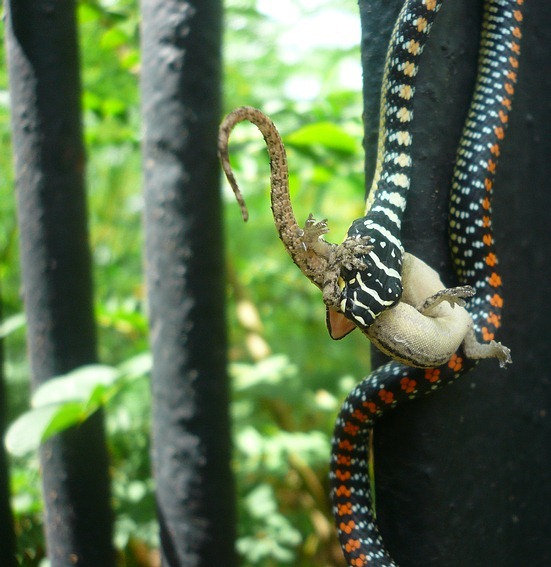 Paradise tree snake eating a gecko. Copyright 2017 Sabri Abdullah and used with permission.